We all like to make sure we are getting the best value for our money. If you want your belongings to be carefully loaded and delivered yet you also want to save money, then you may be able to share the labour and truck costs with another person who is moving in the same direction. You will still get the same attention to detail and care we give to every removal, but you also get the bonus of saving some of the travelling costs as we may be able to combine your load with another. If you are flexible with your pick up day and time, we can liase with you to move you out of your area on the day we are moving someone into your area. We always work to pick you up within the specified time frame providing all goes well with the client we are moving into your area. Even if you don’t live in the Gosford/Central Coast area, you can still save $$ by taking advantage of our trucks heading back down the East Coast from Queensland, Victoria, Canberra, Country NSW - click on our backloading schedule to see whether we are travelling to your area. If it doesn’t show anything relevant, fill in our Removal Quote Request Form to let us know approximately when and where you are moving from and to, and we'll do our best to accomodate your items into one of our jobs ‘in the pipeline’ with space available. If you aready have a full inventory of your household items, please fill out our Full Inventory Quote Request Form. Please remember to be accurate with what items you want moved and what the access is like from the pick up and (if known) the delivery address. Remember we can also STORE your goods while you are between houses and re-deliver when you are ready. If you are wanting to travel back from Queensland, Victoria, Canberra, country NSW or anywhere along the eastern seaboard to locations down to the Central Coast or further south, simply fill in our Quote Request Form. Please remember to be as accurate as you possibly can as our quote is based on the information you give us. We will do all we can to accommodate you. 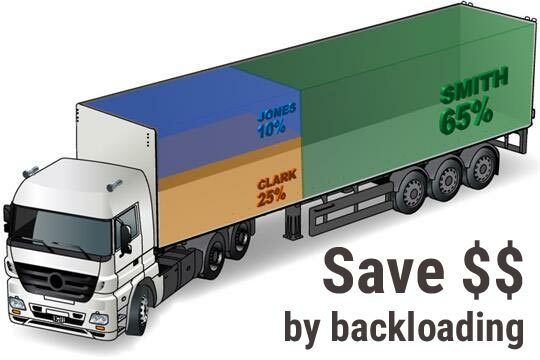 See our backloading schedule for current trips - we also have others 'in the pipeline' so send request a quote by clicking the button below and we’ll get back to you regarding what backload we can do. You can choose to have your belongings moved exclusively. You decide the pick up day and time as well as the delivery day and time. Your goods are the ONLY ones transported on the truck. An exclusive job is more expensive than other types of removals because you nominate the exact timing of every part of your removal – both uplift and delivery. We cater specifically to your needs from start to finish. Because of this, you pay for transport and labour costs in both directions. You may be able to reduce your moving costs by sharing the load with another person who is heading in the same direction ie ‘part-loading’. Whether you have a few items or even a houseful to move, we can often put this on as a ‘part-load’ with another removal. Rest assured, each load is individually sectioned off with specific partitions and colour coded furniture pads. Some flexibility needs to be part of this process to ensure it works for everyone. If it is just a few items - simply fill in our few items questionnaire here. If it is more than a few items – go to our online quotation page for a free online quote. You will also see some of the areas we are moving people to and from on our backloading schedule. These are only some of the moves we have booked in - so make sure you contact us with your dates so we can start working on getting the best price for you. Please note: This list is sorted chronologically on the start date of the journey.